The North End of Virginia Beach is exactly what it sounds like - the northern-most neighborhood on the Virginia Beach oceanfront. This is a quiet part of the beach - a residential neighborhood away from the hustle and bustle of the restort strip. 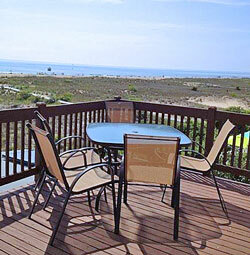 It's a great place to rent a home if you enjoy a beach vacation with the crowded beach. North End Gem with Rooftop Deck This four bedroom, 2.5 bath home has a rooftop deck with great views. The large, 3,100 square foot home was constructed in 1953 with a Frank Loyd Write-inspired design. The home is on the Virgina Beach Historic Register. North End Home with rooftop ocean view. Three bedroom, 3 1/2 baths. Beach access via private walkway in back of the house. Luxurious Home one block from beach This newly renoved home has four bedroom and 2.5 baths and is located one block from the beach. 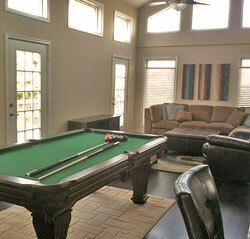 There's a pool table and foosball table, well-equiped kitchen, washer and dryer, and a gas grill on the deck. Classic North End Beach Cottage, Sleeps Six. Four bedrooms and three full baths. Central air conditioning. Outside shower. Non-smoking only. 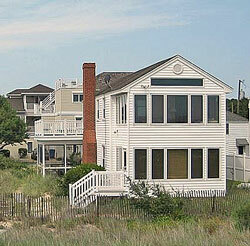 Classic North End Oceanfront Home This five bedroom, 2.5 bath home sleeps nine. The home has stacked oceanside sun porches and there's a screened porch off the kitchen. Six Homes Away from the Beach. This four bedroom, 3 bath home sleeps 9 and is on the oceanside, just six homes away from the beach. Oceanfront Duplex. On second level of a three level duplex. Elevator for easy access. Four bedrooms, 3.5 baths. Sleeps 10. Waterfront with balcony overlooking the beach and ocean. More North End Rentals - Additional rentals at FlipKey by TripAdvisor. North End Hotels: Although most of Virginia Beach's hotels are concentrated along Atlantic and Pacific Avenues at the central part of the resort strip, there are several nice hotels futher north. 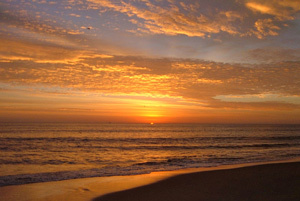 Some of the best are the Courtyard by Mariott Oceanfront North, Holiday Inn & Suites North Beach, and The Cavalier Hotel.